The history of 115 Michigan describes a building that has served its community in a variety of capacities over its entire 80-year history. For the majority of that history, the use of the building was commercial with a series of family businesses supplying necessary services to the surrounding community. Although the Great Depression had descended over the country in 1931, San Antonio was still growing. An article in the San Antonio Light written on October 25 of that year described a new commercial building being constructed at the confluence of Fredericksburg Road, West French, and Michigan Avenue. The article included architectural drawings of the new structure designed by the architecture firm Morris, Noonan, and Wilson. Later articles tracked the progression of construction in the area including one that described the "great amount of parking space available, including the three sides of a triangular park fronting it on the Fredericksburg Road" as one of the attributes of the area. The San Antonio Light published construction photos of the commercial structure at 1241 West French on December 4, 1932. Around this same time, the structure adjacent to it at 115 Michigan Avenue was also being built. Galveston-born T. R. Spence commissioned the construction of this new business after running his produce store from various home locations. He purchased the entire block north of French and south of Russell, building three homes on the north side of the block, and two businesses on the south. These commercial buildings faced a commercial plaza formed by the park, theatre, church, and school. The back lot of 1302 West Russell Place, now known as 115 Michigan Avenue, sat adjacent to the commercial center and the construction of this building completed the plaza that surrounds the park. Spence Produce Company, a family-run local business, successfully operated out of this new commercial structure at 115 Michigan Avenue for over 10 years. In 1944, Spence’s son was killed in World War II, after which he deeded the property to his remaining son and daughter, who lived at 1304 West Russell Place. The family rented the building to the country story F.L. Yoder & Co. In a 1944 San Antonio Light advertisement, the business offers a “squarer deal on your poultry and eggs." The longest running tenant at 115 Michigan Avenue was Elmer’s Automotive. Elmer Kvasnicka moved into the space and operated the business for nearly 50 years until his death in 2001. Elmer ran into trouble with the building when he tried to remodel the front office in 1957. San Antonio’s 1938 zoning ordinance had zoned the building “D”, a designation that did not allow the building to be used as an automotive shop. Former owner T. R. Spence took the issue up with the city in BOA case 2919. Due to the building's construction for commercial use prior to the 1938 zoning ordinance, the board found that it did not fall under its current zoning “D.” The minutes from the case read: “Mr. Spence stated that it had always been used for commercial purposes. He had used it for produce, he said. He sold poultry and eggs. He rented it to a man with a wood-working cabinet shop. 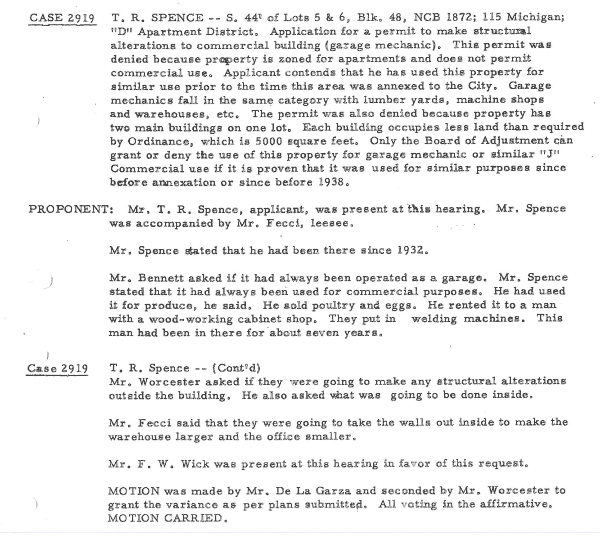 They put in welding machines… Motion was made…All voting in the affirmative.” Elmer was therefore allowed to operate under a “J” use without a zoning change and allowed to continue operating in the space. In 1996, the city approached Elmer, citing again that he did not have proper use for his shop. Elmer went to the city referencing the BOA case from 1957 and again the historical use of the structure, and was granted a Certificate of Occupancy. The following year, under ordinance 86704, the city changed the zoning of several hundred properties without a comprehensive review of each individual space. Despite the continuous efforts to prove that 115 Michigan was a commercial structure, the city changed the zoning from “D” to "R-2". Spence Jr. was notified of this change, but did not feel it was of concern since Elmer was granted a Certificate of Occupancy a year prior. After years of dedicated service to the neighborhood, Elmer passed away. Often communities think of auto garages as dirty commercial businesses, but Elmer's neighbors remembered fondly the open bay doors and his collection of antique cars that he constantly worked on, almost serving as a living museum of the automobile. T.R. Spence, Jr. sold 115 Michigan Avenue to Santiago “Jimmy” Martinez, who ran Alamo Golf Carts and rented another property within the same block. Martinez then leased the building to young artists Ron Garcia and David Garcia who had perviously rented a property next door to 115 Michigan Avenue for their home, studio, and gallery called La Luna Sol. 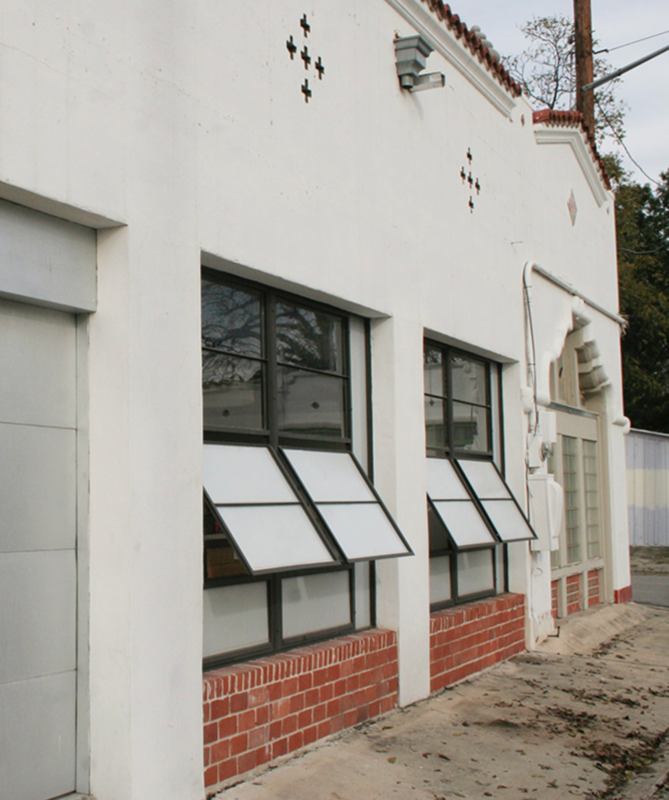 During the lease, the studio partners kept the Elmer’s Automotive sign out of respect for the history of the structure. The Studio operated at 115 Michigan for three years. In the end, the Rodriguez family flipped the property for a profit, causing a significant increase in the property value with their adaptive reuse of an urban living space, and ultimately changing the character and use of the historic commercial building. In 2007, local architect Jonathan Card purchased the building from the Rodriguez family. Using his specialized experience in the revitalization of historic structures, Card reintroduced some of the original integrity to the building by opening the floor plan and honoring the industrial nature of garage doors with his use of steel and split light windows. The Card family eventually outgrew the space, and in 2012, the property was sold to Jeff Dersh. Dersh intended to use the structure at 115 Michigan as a live/work apartment, and he hired what is now known as French & Michigan to make slight adjustments to the interior layout. After just a few months however, personal reasons caused Dersh to change his plans, and he offered the space for lease to the designers at French & Michigan. Immediately the firm began plans to return the building to a public space for public use. Originally, French & Michigan's plan called for a zoning application of IDZ C-2 with single-family use, a model reinforced by the Midtown Neighborhood Plan that had been passed for Beacon Hill in 2001 to have more mixed-use businesses in commercial spaces along the Fredericksburg Corridor. The intent was for the building to house an office space for designers, an art gallery, and a small apartment for the renter. It would also introduce the idea of the design cafe—a walk-up coffee bar allowing neighbors to get quick design solutions for their home. In August of 2013, French & Michigan began the process of approaching the neighborhood and city to present their proposal and apply for appropriate zoning. After negotiating with neighbors they brought their request down to Neighborhood Commercial. After further requests for compromise, the business eliminated the walk-up cafe, moved the design firm out, and requested simply a conditional use for an art gallery, keeping the building primarily residential in use. Of note is that every commercial business that was housed in this structure for 72 years came into 115 Michigan Avenue with a business already established, looking for a larger and more appropriate space for their operations—this includes French & Michigan, which had operated as a no-name business in Southtown since 2008. After a year of consideration, the San Antonio City Council approved the zoning application of tenants Billy Lambert and Celeste Wackenhut. 115 Michigan now functions simultaneously as the partner's home and art gallery, a cultural space accessible to the local community.